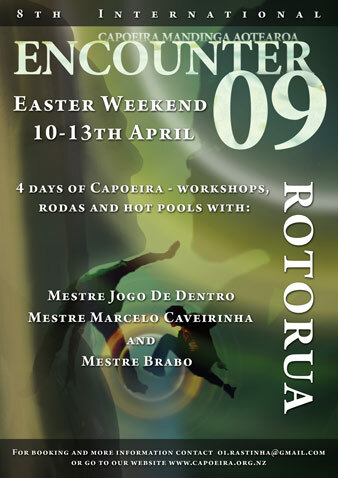 4 days and nights of Capoeira – workshops, rodas, hot pools and the best food ever! Prices include meals and accommodation at Mataatua Marae. New students extended Early Bird offer from 01/01/09 320.00 if paid in full within 4 weeks of starting classes (after early bird has expired). This applies only to new students who become members from the start of 2009. Please email oi (dot) rastinha (at) gmail (dot) com for payment information or if you have any questions. Please Note: Deposits are NON-REFUNDABLE and we apologise for any inconvenience.